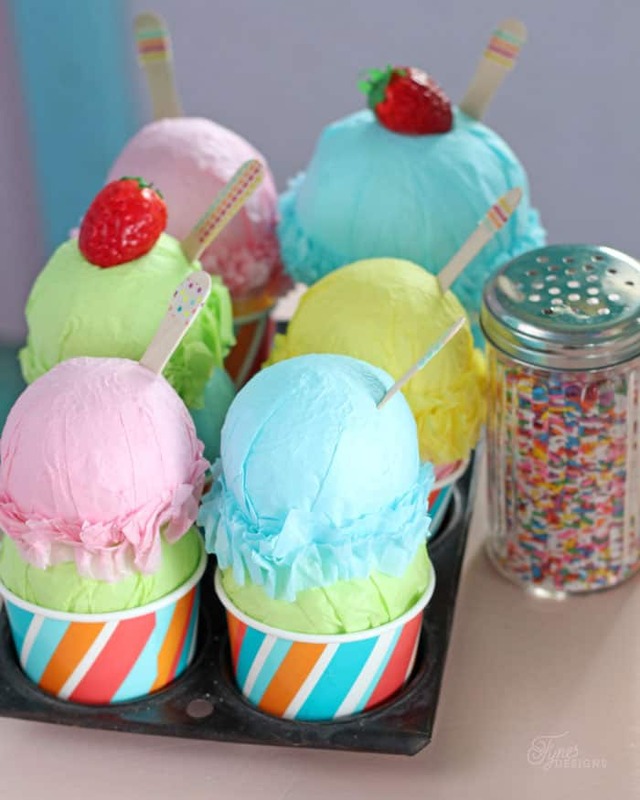 It is birthday party time around here and this year we are gearing up for a fun ice cream party. What’s a kid party without ridiculously cute decorations? So when I was asked to join the FloraCraft® Make It: Fun® Ball Blitz I knew I wanted to try making some cute ice cream sundae decorations. 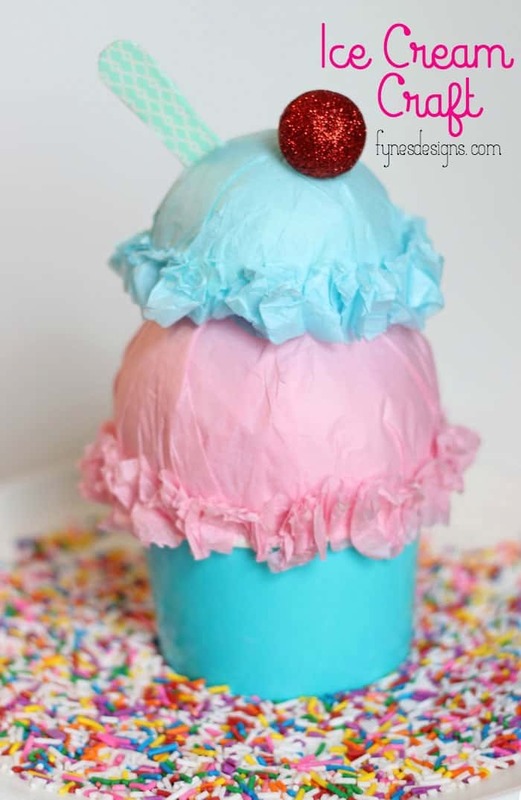 I’ve seen loads of ice cream party decorations (like these Sugar and Cloth fabric ones, fun honeycomb ball ones, or these cute tulle cones), but all of these were in a cone, and since we were having sundaes, using a paper cup was perfect! 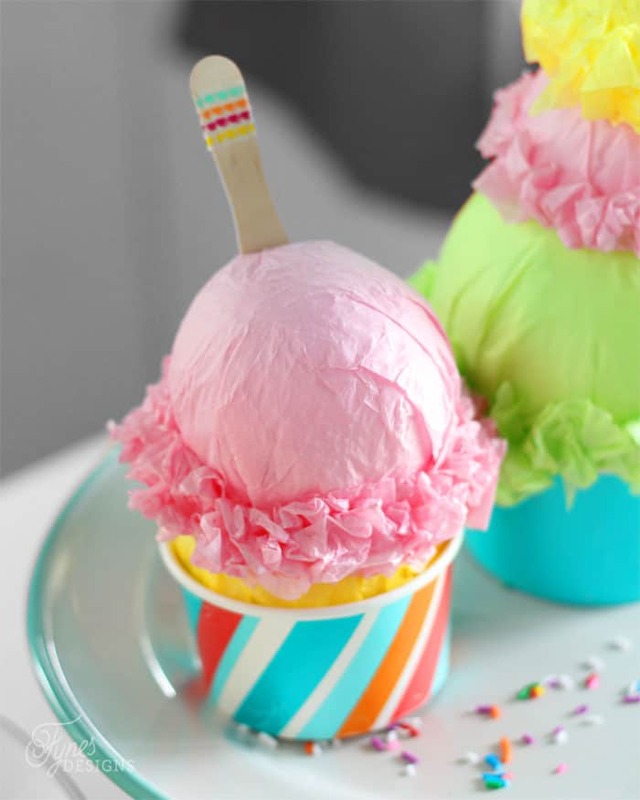 Creating this ice cream sundae craft is super easy, and you probably have most of the supplies around the house, or a quick trip to the craft store. Using 1 sheet of tissue paper folded in half, wrap it round the largest FloraCraft® Make It: Fun® Foam Ball, secure it with an elastic. Trim the tail of the tissue paper. 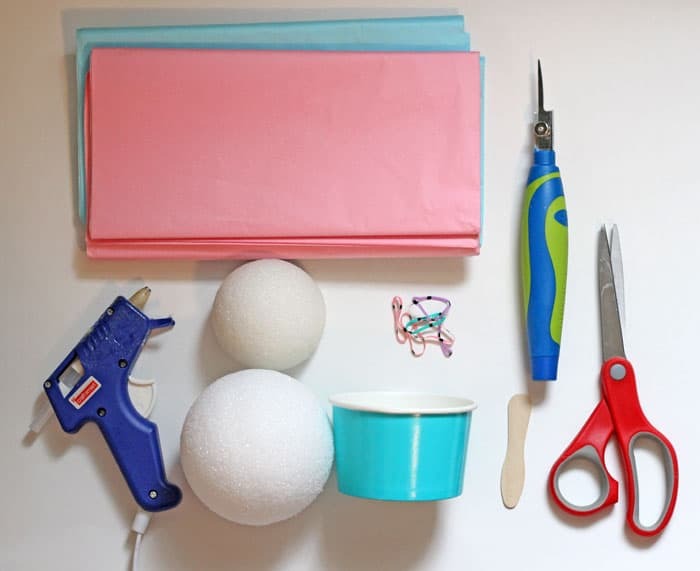 Run a bead of hot glue around the inside edge of the paper cup and place the foam ball in elastic side down. Using the FloraCraft® Make It: Fun® Foam knife cut the smaller ball in half, and a bit of extra from the centre of the ball. 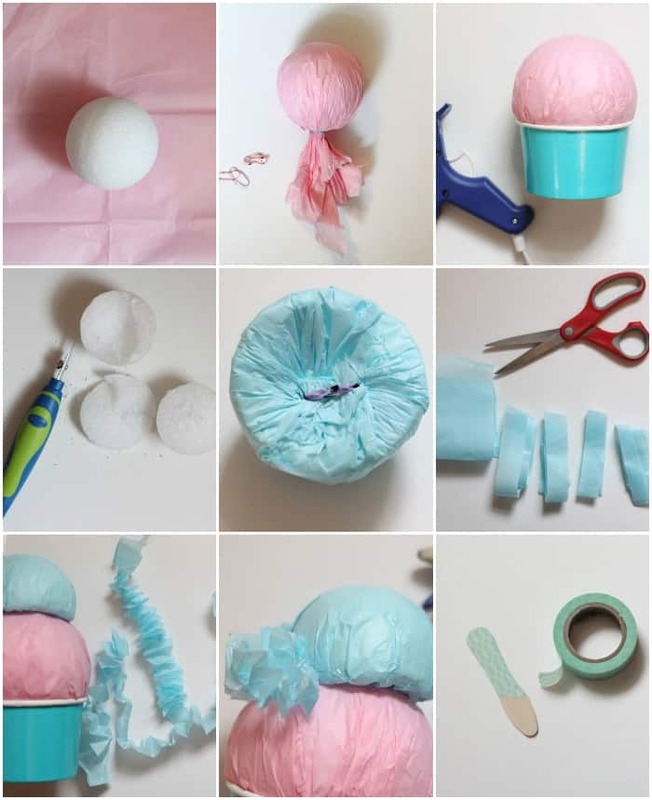 Repeat the tissue paper step with one half of the smaller ball. Glue smaller ball on top of the larger ball. Cut small strips of coordinating tissue paper, and slightly crumple. Run a small bead of glue around the seam where one ball meets the other and hot glue the tissue paper ruffle around. Repeat this step around the rim of the paper cup. Garnish the ice cream with a spoon and a glittered foam cherry- yum! The color combination possibilities are endless with tissue paper, you could even use polka-dot that would look like sprinkles. I love how the creases of the tissue paper make the scoop look realistic. The kids even got excited when they seen them, I think I had them fooled for a minute! 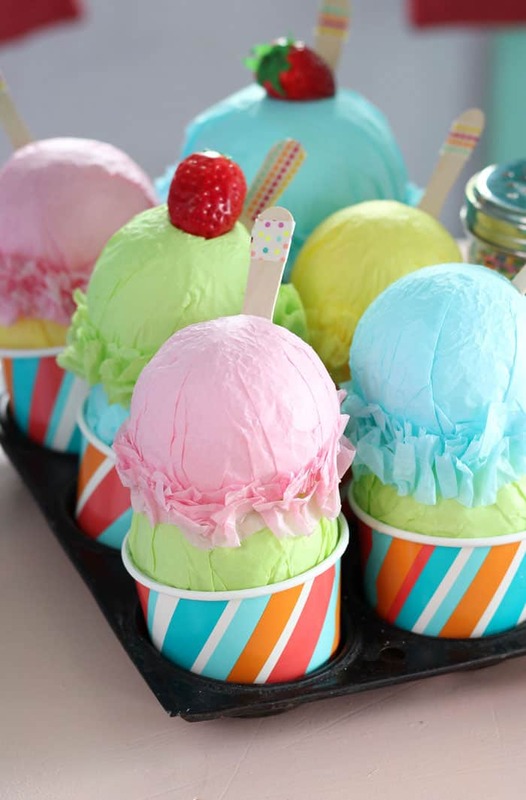 The Ice Cream Sundae party decorations are super cute and the kids love playing with them. I’m stuffed though, I think I’ve eaten 4000 pretend sundaes in the last week, so many flavours to choose from! Thanks for joining me for this fun ice cream sundae craft. These are sweet as can be, Virginia. Really adorable, and the kids will love them. Happy summer! Thanks Sharon, The kids are having so much fun pretending with them! That’s a really cute idea. Makes me wish I owned an ice cream parlor so I could put those on display in a window. :) Does anyone have any ideas on what could be used to make artificial nuts? Thanks, We just had an ice cream party for my little guy who turned 4 too! It was a lot of fun… a little bit on the sticky side though! I seen that too! Kinda clever!! Thanks so much for visiting Cathy! This is such a precious craft to make with the kids this summer. Plus ice cream is one of my most favorite things anyways. I better have some actual ice cream on hand when making this because I will definitely be craving some afterwards. Thank you for sharing at Motivational Monday Link Party! Hope to see what you have been up to again this week. That looks so delici…. oh wait. Ü Darling craft!